Yesterday I made this very Alexz-inspired Halloween decoration for one of my friends who has been helping me out a lot with my back. I wanted to make something season-appropriate and handmade, and thought something like this would be perfect for a door hanging. 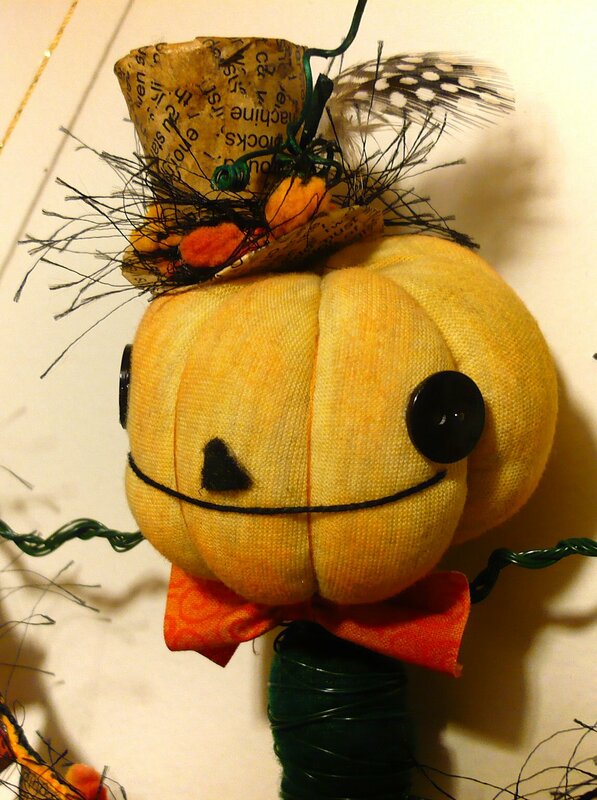 The head is made from a stuffed scrap of jersey fabric with string wrapped around it. The first head I made was from plain old non-stretchy cotton and it was an epic fail. Definitely important to use stretchy fabric! The body is stuffed felt, wrapped in green floral wire, then the arms and legs are 8 twisted strands of the same wire. Hands and feet are felt :) I really like the way it turned out... I think I'll have to make another one to keep! I was especially proud of the little hat... I made out of toilet paper tube and hot glue, then covered it with bits of paper to hide the toilet paper tubeness of it. With a little feather, ribbon & novelty yarn, it looks pretty darn cool if I do say so myself. Happy Wednesday! He's wonderful! Such a great way to add some Holiday love to the door. That wee hat is too cute! oh wow. this came out fantastic!! i might have to give something like this a go myself. love it! Wonderful, Kira! I've been thinking of making just the banner, myself, but your idea is FAB-ulous! SO CUTE! I love everything about it! You are so awesome!